By Quentin JodieThe plush manicured grounds inside the Salt River Fields at Talking Stick in Scottsdale, Ariz., was overrun with Native American kids between the ages of 8 to 16 on Saturday. They took part in the Second Annual N7 Jacoby Ellsbury Baseball Camp on the same complex that is used by the Arizona Diamondbacks and the Colorado Rockies during the spring training session in Major League Baseball. Ellsbury, who is a registered member of the Colorado River Indian Tribes and centerfielder for the Boston Red Sox, conducted his baseball camp to the tune of 130-plus kids, which included a few athletes from the Navajo reservation. 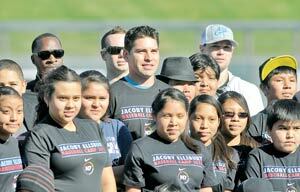 "It's great to see the kids' faces light up," Ellsbury said. "Last year we started out with 60 kids and this year we had 130 of them. "Comment: For more on Jacoby Ellsbury, see Ellsbury Finishes 2nd for MVP Award and Ellsbury Wins Golden Glove. It's nice to learn that Jacob Ellsbury is hosting a baseball camp. I'm a Red Sox fan and it would be nice to watch him in action teaching these kids. My sister in law's niece was in attendance in that workshop! She loves baseball. How happy she was to meet girls at her age who are also playing softball.